We have been talking a lot about shrimp farming lately, since we are putting the finishing touches on Raising Shrimp. We have mentioned some of the environmental damage it can cause, but unfortunately this does not mean that wild shrimp is always the best alternative. 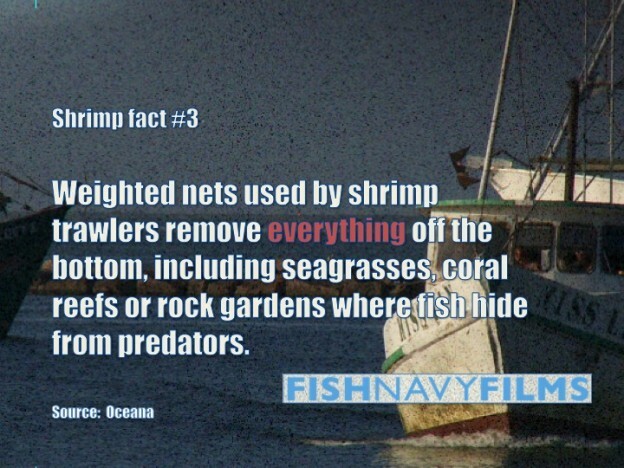 In fact, shrimp boats using bottom trawlers can have a devastating impact on the ocean, removing any living creature in their paths. There are some sources of wild shrimp that can be great though. The Monterey Bay Aquarium‘s Seafood Watch program recommends the spot prawns of the Canadian and US Pacific. Spot prawns are caught in trap, have less bycatch (which can be controlled more easily) and less damage to the bottom (although there can be an issue if the traps are dragged or bounce onto fragile corals). See those squiggly lines? 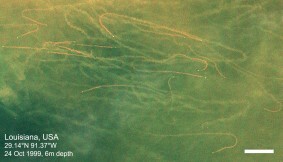 Those are the tracks left behind from trawlers. The nets are dragging behind them. Sometimes when damage like this is done in the ocean, we have a hard time understanding the impacts because we are so far removed from the water. So let’s put it this way: if trawling were happening on land, it would be like driving massive lawn mowers through forests and scooping up everything in their paths for thousands of miles. Sure, trees can grow back. The animals that are scooped away and killed can be replaced with new ones. But how long will that take? And will everything be back to normal afterwards? Eating seafood can be a tricky activity. It is hard to know what the best source is by just reading the signs at the supermarket. Luckily for us, we can check online or even consult an app in our phone to see if the seafood we are eating is good for us and for the environment. With shrimp being as popular as it is, we should hope that everyone takes a moment to check. Why not just stop eating seafood at all, like many of us who care about the ocean have chosen to do–as the ONLY way to ensure that we aren’t being pert of the problem. Thanks! This is true- it would be a sure way to know you were not in any way responsible for trawling damage directly or indirectly. Some quite well-known ocean advocates have decided that this is the only way, such as Dr. Sylvia Earle. There are a lot of people who love seafood too much to give it up altogether though. They enjoy the taste or choose to eat it for health reasons or even religious reasons. It’s for people like that that we like to give the right tools and resources to find better choices (sustainably farmed or harvested seafood).